Fountain Coins is now offering coins, stamps and other collectibles for sale inside Big 3 Sports Cards & Memorabilia. Visit us to see our current inventory! Free World Coins for kids 15 and under. Stop by 16716 E. Parkview Ave, Suite 106 in Fountain Hills. We are located directly behind Cox Communications. You can also access our parking by entering next to Leslie’s Pool Supplies on La Montana Dr. across from Bashas’. Our hours are typically Tuesday & Thursday from 10 am to 1 pm, and Saturday from 10 am to 2 pm. Or use the Contact Me page on this site to meet with John by personal appointment. Who is Fountain Coins of Arizona? Fountain Coins of Arizona is owned by John Gibson (Hindsight Enterprises, LLC). 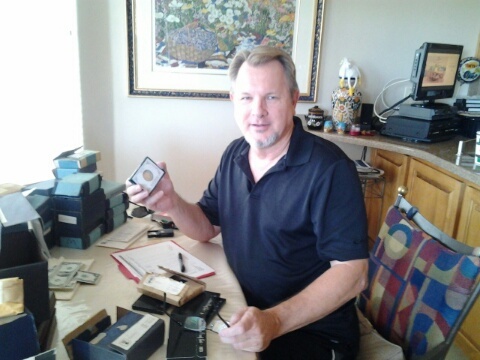 John is a coin collector since 1967; a Numismatic Consultant, Educator, Appraiser, Evaluator and Broker since 1989; and a member of the American Numismatic Association since 1990. He is past president of the Mesa Coin Club, and founder and past president of the Fountain Hills Coin Club. John educates people about their coin collection; helps them determine the value of their collection; provides options for the disbursement of their collection; and, when collectors are ready to liquidate their collection, brokers the collection through a network of buyers John has developed over many years. This “network” is what sets John’s broker services apart from dealing with a single buyer. Additionally, John keeps abreast of the current market including retail values, and what buyers are currently paying for various types of coins. Why does John offer these services? As a consultant and educator, he believes coin collections should stay with family members whenever possible, unless there are no relatives or no one is interested in the collection. As a collector of 20th century coins, mint errors, and a student of the coin manufacturing process, John has a passion for each coin or set of coins as pieces of art. Often each coin in a collection was hand selected by the collector to “fit” in the overall collection. The collection represents a passion valued by the individual collector. This passion or love of coins is a what defines an individual collector. John values this. For a complimentary phone consultation and a price list of services please call John. Use the Contact Me option above for his phone number or to email him.